Now that the Chinese New Year holiday is over, it's back to work! Get some fresh inspiration for your upcoming renovation with these gorgeous interior design ideas. With some creativity and innovation, anything is possible! Bid goodbye to the tile/wood/paint feature walls and take it one step further. Install a personalised work of art in your home by using rocks to create a mural on your wall. This will help to create a beautiful and eye-catching focal point, sure to make any homeowner proud. If you want to break out of the norm, explore unconventional ideas like these! Creating a tower clock in your window with decals is one of the simplest ways to do this. This mixed media coffeetable is a stunningly simple way to introduce interesting nature-themed furniture into your space. The mixture of metal, wood and glass, is a great way to keep in tune with your industrial aesthetics. We haven't seen many homeowners installing stained glass windows in their homes yet. If you want a really unique home, this is definitely something you could look into. Whether its a stained glass door in your bathroom separating the wet area from the dry area, or stained glass partitioning for your home office, there are simply too many ways to incorporate stained glass in your home! Have you heard? Geometric designs are all the rage now – ranging from geometric plates and planter pots, to geometric tiles and patterns. Up the ante with this ahhhhmazing prism table guaranteed to lift your spirits everyday with one look at the indescribably ethereal colours! If you've always loved astronomy, stars, the idea of space and what could be out there – bring the galaxy into your home with an out-of-this-world galaxy wall mural. Don't like your view of HDB blocks? 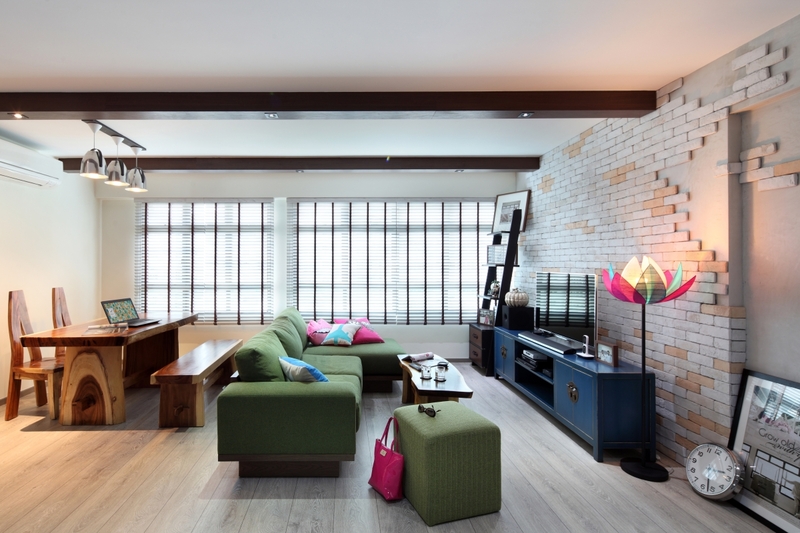 Then consider getting blinds that provide a better view with strategic cutouts creating your favourite scene. How about the Eiffel Tower in Paris? Or Singapore's very own skyline complete with the Singapore Flyer and Marina Bay Sands? Wooden floors can get a little boring after awhile. Apart from experimenting with herringbone or chevron patterns, another wooden flooring design you could consider are these really interesting interlocking wooden tiles. Just an idea! An easy way to spice up any home, is to add something a little unexpected through rugs. Galaxy-printed rugs, or funky shaped/coloured rugs, you'd be surprised how a good rug can really pull the look of a room together – simple and fuss-free. As Renotalkers, we scour all sorts of home and living websites for the latest in the home renovation and design industry. One upcoming trend we've noted recently, is the rising use of glow-in-the-dark paints. Some homes in America have even used the latest innovation that creates glow-in-the-dark driveways (roads), for further accident prevention! A really cute nature/bohemian theme for any little girl's room, a tree canopy bed will help to breathe a breath of fresh air into the space – while setting the scene for a lovely and cosy little nook. How amazing does this look. It's minimal in design and looks so comfortable at the same time. A soak in this hammock tub every Friday night would do so much wonders to wash away the stress of the week! Its definitely a stand-out piece to add in your home – probably with a stand-out price to match! If you're bored of the standard bathrooms, go all out and whacky with this whimsical yellow submarine bathroom. Featuring mosiac tiled walls and special bathroom accessories in accordance to the theme, feel free to get creative with any theme of your own. If you've seen this around Renotalk, great! If you haven't, check it out. This design marries functionality and eclecticism simply by building a sink over a bicycle fixed to the wall. The homeowners went a little further by introducing subtle racing elements in the black and white tiles. Thumbs up to the creativity! We've talked about fibre optics ceilings before, now how about fibre optics floors? Get lost in wonder as you step on your starry floors – it's especially perfect for the dreamers and the adventurers, and the kids will surely love it too.